Millions of Americans got a nasty surprise this week in their paychecks. Their pay was effectively reduced due to the taxation football being fumbled once again by our so-called esteemed leaders in DC. Many Americans believed these politicians on both sides of the aisle when they claimed that they had to pass Obama’s mandate to raise taxes, because not to would be catastrophic. It would raise taxes on the middle class in the midst of a managed depression. Well, they passed the financial crap sandwich to avert the fiscal cliff and guess what? They raised taxes on the middle class. It was the middle class who makes $30,000 a year and up that was hit hardest. Not the wealthy, who were hurt very little if at all. This folks, was the Progressive elites sticking it to middle America to further fund their lavish lifestyles. And Obamacare hasn’t even really bit us yet – just wait. Some insurers this morning announced premium hikes of approximately 26%. The party that blocked tax increases since George H.W. Bush agreed to raise Ronald Reagan’s top rate of 28 percent to 35 percent, thus repudiating his “no-new-taxes” pledge, just signed on to one of the largest tax increases in history. Payroll taxes on working Americans will rise by a third, from 4.2 percent of wages and salaries to 6.2 percent. For couples earning $450,000, the tax rate rises from 15 to 20 percent on dividends and capital gains, and from 35 to 39.6 percent on ordinary income. The death tax will rise from 35 to 40 percent on estates over $5 million. Obamacare will push those rates up further. And now we learn the bill was stuffed with tax breaks for windmills, NASCAR owners and Hollywood. Not only did they further enslave Americans and bleed them for more taxes, they didn’t cut spending AT ALL! They increased spending by about 3.9 trillion. What does it say about the nation’s finances when spending estimates can only be guessed to within the nearest 2 or 3 trillion dollars? I ask you, how long will America submit to this thievery and forced serfdom imposed on our citizens? What will be the tipping point? It could be any number of factors, but we are getting closer and closer to ripping our country apart. According to Bob Owens and Pat Buchanan, the seizure of arms will do the trick and they are right. According to Fox News and Mark Levin, the way both sides dealt with the fiscal cliff is a big step towards conflict and they are right as well. Just what does everyone think will happen when food stamps, social security, disability, pensions etc. stop, because there is no more money or money is worthless due to hyperinflation from printing? What do they think will happen when the government moves to confiscate our guns? (You think this is about protecting “the children?” Dream on.) It won’t be pretty in either scenario. 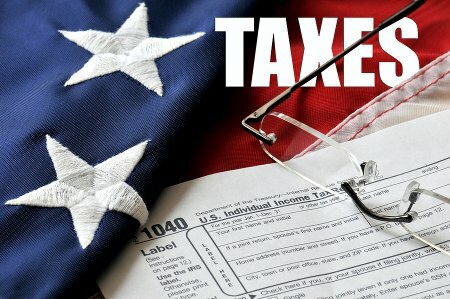 Taxes, brought on the Declaration of Independence. The seizure of arms, sparked the American Revolution. Everyone who sat down with their accountants in the past 48 hours is dazzled, dazzled about what’s gonna happen. And I’m not just talking about the wealthy people, because we’re starting to talk about healthcare, small businesses — what they’re thinking about at the end of 2013. This is nothing new. It seems every time there are hard times, there is a Progressive in office. Their solution is always to tax more, not cut spending. Build bigger government and more sweeping regulation to control America which stifles inventing and entrepreneurship. They further empower the IRS as a weapon and engage in criminal activity to line their pockets. Then at some point, a sane conservative comes in and cuts spending and taxes, and sanity and prosperity returns to America. Remember that Carter had a tax rate of 70% or so when in office. America really suffered until Reagan came in and eventually slashed the tax rate to 28% – America boomed. You saw the same thing with Calvin Coolidge, etc. We are running out of time for a true Constitutional Conservative to step forward and save us from the Progressive pit. The ink has not even dried on the latest tax monstrosity and Progressives such as Maxine Waters and Nancy Pelosi are going down the French path calling for more taxes on the wealthy. Two points here… 1) The wealthy are not the ones being hurt by these rising taxes. They have shelters, etc. in place and they can always leave. 2) The Progressives are liars. They fully intend to crush Americans with these taxes and bleed every penny they can from us. And when the crash comes, they will be free to form a new and dictatorial government. As Michelle Malkin says: Elitism. Exemptions. Evasion. Watch for massive taxation that is on the way: carbon taxes, value added taxes, taxing by the mile for cars and on and on until these Marxist fiends are stopped. A patriot can definitely love his country and hate his government. Ask the patriots of ’76. Our middle class is being absolutely destroyed and it is deliberate. Cloward and Piven is working and we stand by and just scratch our heads as the Progressives carry on their merry way towards the destruction of America. Soon there will only be the poor masses and the rich elite. Poverty and debt are rising in the wake of rising taxation. Food stamp usage is at an all time high and I contend there is real hunger in America now, behind the closed doors of our homes and soon in the streets. Employment statistics are a lie as is the stock market. Unemployment should be closer to 22 to 30% and the stock market is a Progressive fantasy. It won’t last. It can’t with the printing of money and the non-stop spending. We are broke and our debt will some come due with no way to pay the piper. You can bet our enemies are hungrily waiting in the wings. It’s hard to tell whether fiscal collapse or war will hit first, but they are the Progressive two-step anyway, always arriving in tandem during the reign of a Liberal. A nation with just 800,000 law enforcement officers and 3 million active and reserve military personal cannot easily defeat and enslave a free people armed with 300 million firearms, even if large numbers of the police and military didn’t walk away or switch sides to follow their oath to the Constitution instead of any given leader, as many assuredly will. Retribution against those who would be responsible for such a conflict by attempting to undermine the Constitution is assured. They will face extra-judicial justice walking across the street with their families, or in a formal war crimes trial. Either way, their attempt at tyranny ends in death or prison… hardly what these would-be elites imagined for themselves as they planned to loot the remains of a once-powerful economic engine. I have two words of advice for those that imagine they can subjugate the arsenal of freedom with the stroke of an autopen. When patriots say, “Don’t tread on me…” they mean it. You cannot strip us of our Constitutional rights and not expect that we will defend the Republic. This is not the ‘Home of the Enslaved.’ This is the ‘Land of the Free’ and free men and women will fight as such. Tread carefully indeed.